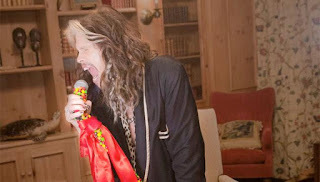 Skittles candy revealed today that Aerosmith's Steven Tyler stars in the Skittles Super Bowl 50 Ad. Mars, Inc. announced that Wrigley's Skittles Brand will return with all new Skittles Super Bowl 50 commercial back in December without revealing details. Skittles released an image showing 67-year-old Steven Tyler holding a microphone and stand covered in Skittles. The lead singer of the legendary rock band Aerosmith dropping a new single tomorrow titled "Red White and You." His solo project is not rock its country. Somebody is gettin old. The Skittles brand has not revealed any further details about the Skittles Super Bowl 50 Ad. Something tells me that there will be more than one celebrity in the Skittles commercial.